Forcing “a government of the 1%, for the 1% and by the 6%” into canceling a national exam is a heroic act of political dissent and probably the greatest political surprises of 2016. 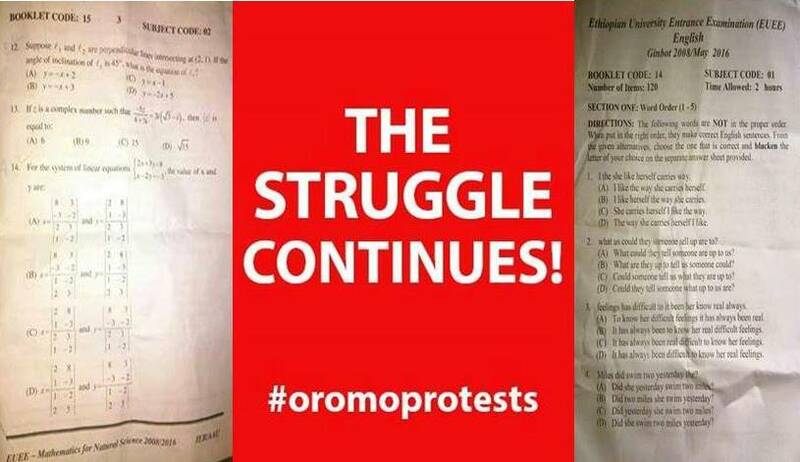 There is absolutely no moral case against the leaks but to try and concoct one is to ridicule the sorrow and anguish of Oromo students and the sacred dead of the ‪#‎Oromoprotests‬. Those who are not visited by the loss and violence that rained down on Oromo students and their families have the moral obligation to stand with the Oromo students. If our ‘shared humanity’ and the ‘ethical universalism’ that you often invoke to dismiss the politics of the particular is nowhere to inform this claim, at least there is something to be said about the bonds of solidarity. If you can’t take the longer view of history, at least this is not too much of an inconvenience to take for a fellow student. This government of the 6% knows well how to divide and conquer, from winning 100% of seats in parliament to manufacturing crisis in the Horn from which it reaps fruits, from manipulating food aid for political reasons to crippling and demobilizing opposition politics; from using its courts to eliminate political adversaries to conning the West into paying for its surveillance infrastructure. By producing policy driven evidence, it has managed to camouflage and obscure all of these things, with the cooperation of the West, of course. It was clear to this government what to do to convert absolute falsehoods into believable narrative facts. What to do or how to deal with the Oromo protests, however, is not.